Modi singled out the issue of corruption, which is being raised by Amit Shah in each of his public meeting in Himachal. KANGRA: Prime Minister Narendra Modi, while seeking to set the poll agenda of Himachal Pradesh Assembly elections, invoked corruption charges against the incumbent chief minister Virbhadra Singh to term leadership of the rival party as members of a laughing club. Aware that wresting power in Himachal Pradesh would give credence to the BJP slogan of "Congress Mukt Bharat", Modi claimed that the Opposition party is an epitome of rotten thoughts. Addressing two rallies in the day as part of BJP's strategy to unleash "Brand Modi" in the last few days of electioneering, Prime Minister singled out the issue of corruption, which is being raised by the party chief Amit Shah in each of his public meeting in the state. The incumbent chief minister, who is popular among the people as Raja Saheb, is seen as the only credible mascot of the Congress despite being 83-year-old with strong hold on about 30 per cent Rajput electorates in the state. "The Congress in its manifesto claimed that the party will have zero tolerance for corruption. When the chief minister is out on bail in a case of disproportionate assets while party President and Vice President also being out on bail, it only looks as a laughing club. Can anyone believe claims of the Congress," Modi in his trademark style asked the people at a rally in Fatehpur Assembly constituency in the Kangra district of the state. He addressed another rally at Dhaula Kuan in Paunta Sahib. 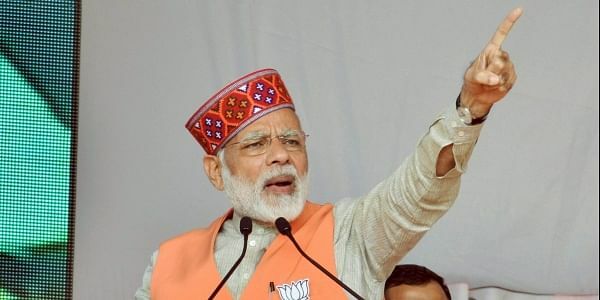 Prime Minister is slated to address at least seven more rallies in the hilly state even while the BJP chief has gone an overdrive to step up the campaign of the saffron outfit. Though Congress Vice President has not yet addressed a rally in the hilly state after the announcement of the poll dates by the Election Commission, Prime Minister sought to hit out at him for his meeting with a Chinese envoy during the Doklam standoff. "Rahul Gandhi chose to enquiry about the Doklam standoff from a Chinese envoy in place of trusting our Army," Modi quipped. Himachal Pradesh along with Uttarakhand has a strong base of Army regulars and veterans with whom the saffron outfit is seeking to cash in on by raising "tough" stand in border disputes with China and Pakistan. "In place of trusting and enquiring from the government and foreign ministry, you (Rahul Gandhi) went and met the Chinese envoys on the issue of Doklam standoff," Modi charged. Stating that he was sorry to say, Modi alleged that the Congress Vice President betrayed basic understanding.